All images enlarge with a click; all blue text leads to additional info with a click. 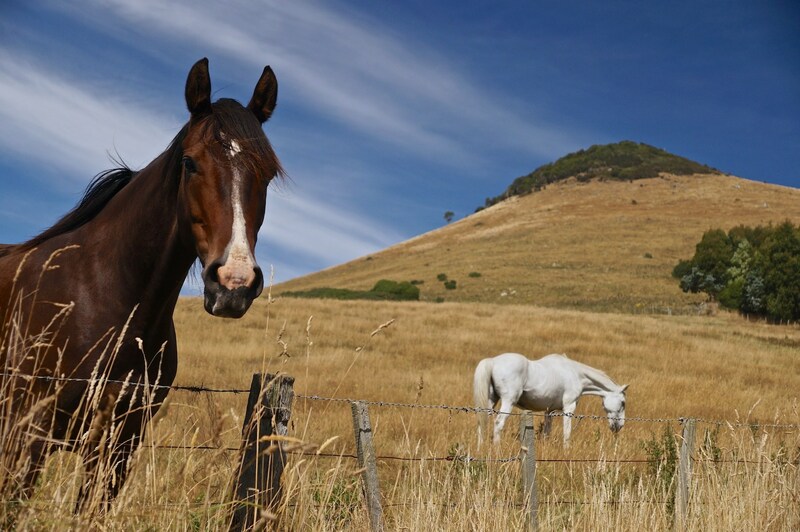 New Zealand’s South Island offers some great bicycle touring possibilities. 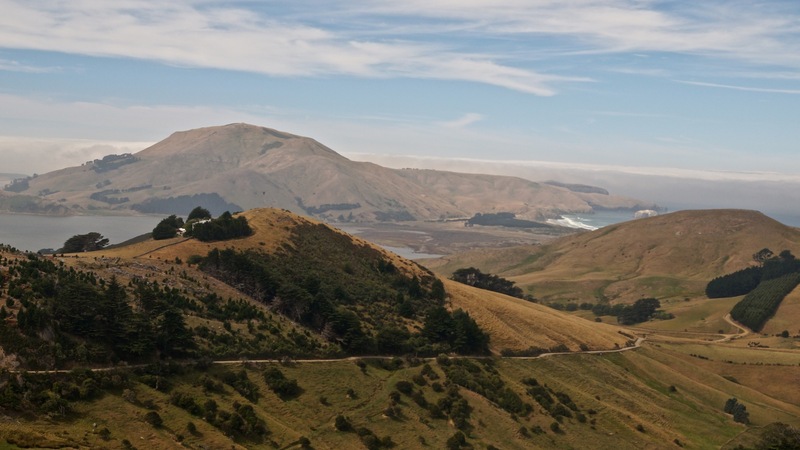 While I did not have the time to savour the northern third of the island, the 1400-kilometer route I followed from Christchurch to Invercargill contained more than a few memorable days. 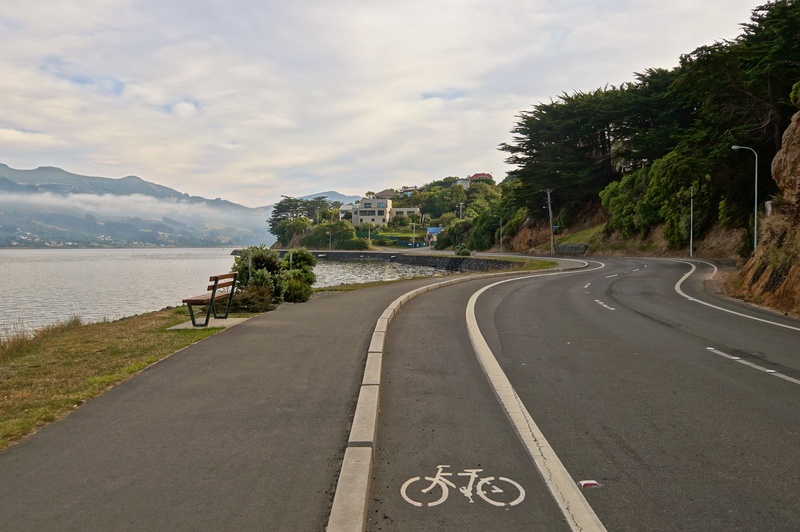 One sheer wow day was the one I spent cycling the Otago (pronounced Oh tah go) Peninsula just next door to the university town of Dunedin, the South Island’s second largest city and a place with a nice mellow vibe to it. From my base camp at a motel on George Street not far from the campus of the University of Otago, I set off on my Cannondale Touring Plus feeling much lighter than usual. I was leaving behind the four panniers and fifty pounds (23 kg.) of stuff that I had felt important enough to take along on my Kiwi ride. All I had was my camera, a rain jacket, a couple of energy bars, and some water. What a difference it makes! 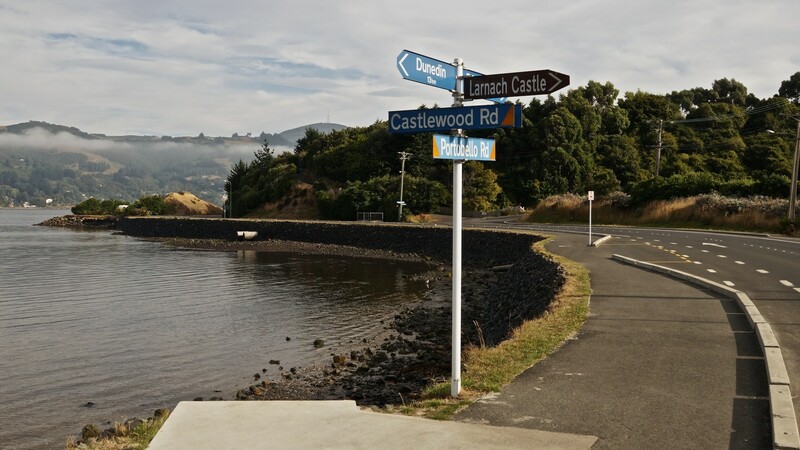 To get to the start of the Otago Peninsula I cycled down one-way Castle Street from the north end of town and passed the train station on my left as Castle becomes High Street and then merges with Cumberland Street as it continues south. When I got to Jetty Street I turned left to the harbour and Wharf Street and its designated bike lane. In 300 meters Wharf Street becomes Portsmouth Drive which takes you to Portobello Road. The most complicated part of the day is done! 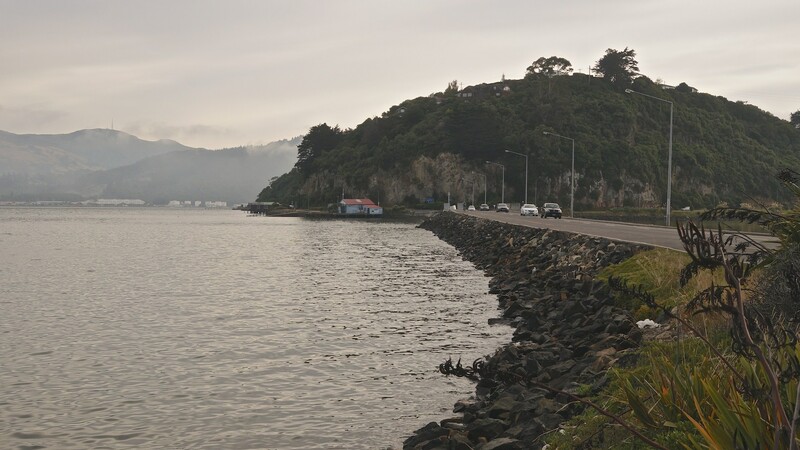 Get ready to embrace a pretty easy 18-kilometer ride along the waterfront all the way to Portobello Bay. Traffic on the weekday morning I was there was very light; there seemed to be more traffic coming out to downtown Dunedin from the peninsula than vehicles going in. 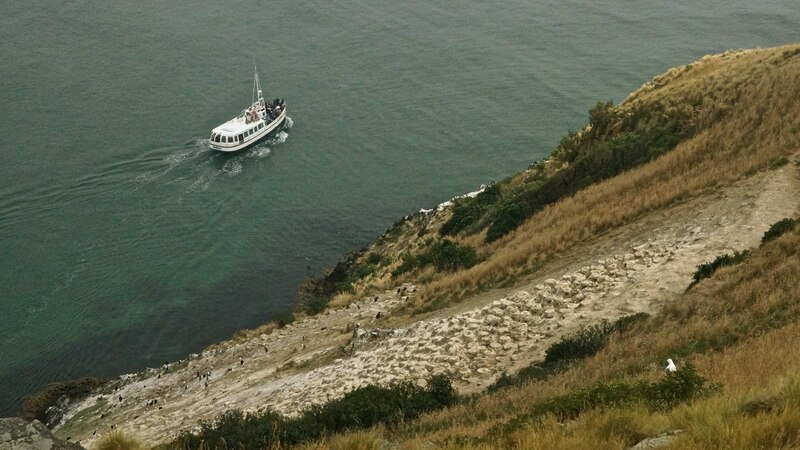 Later in the morning I did notice a few buses and rental vans making their way to the albatross colony at the far end of the peninsula. 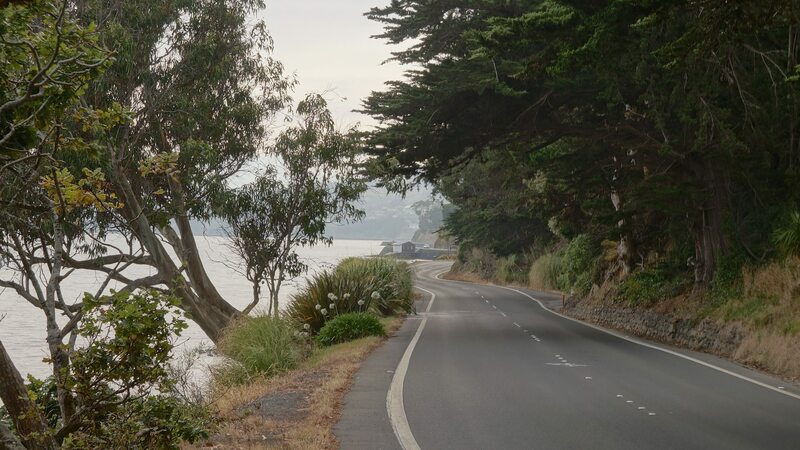 Only a cyclist will want to examine the following pix closely, as they show what the road was like – sometimes with a bit of a paved shoulder, occasionally with a dedicated bike lane, and usually quite narrow and running along the water’s edge. morning mist lingers as I cycle the Portobello Road at 9 a.m.
a major junction on the Portobello Road … Castlewood Rd meets Portobello. 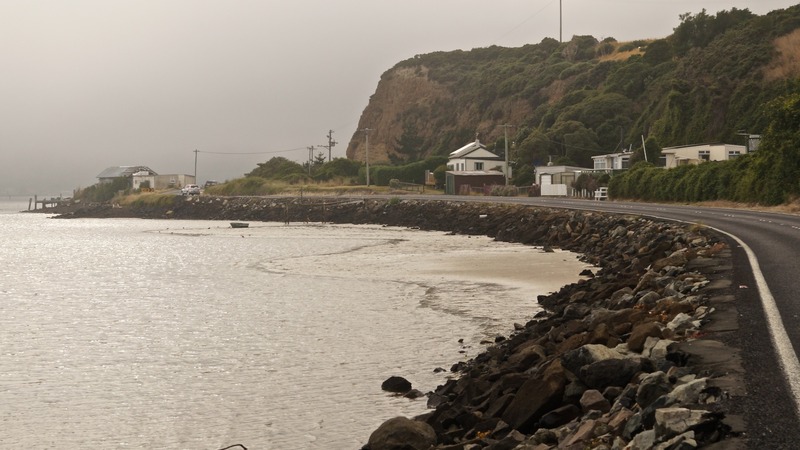 Beyond the village of Portobello, the road becomes Harington Point Road as you make your way to the Royal Albatross Colony at the northern tip of the Peninsula. 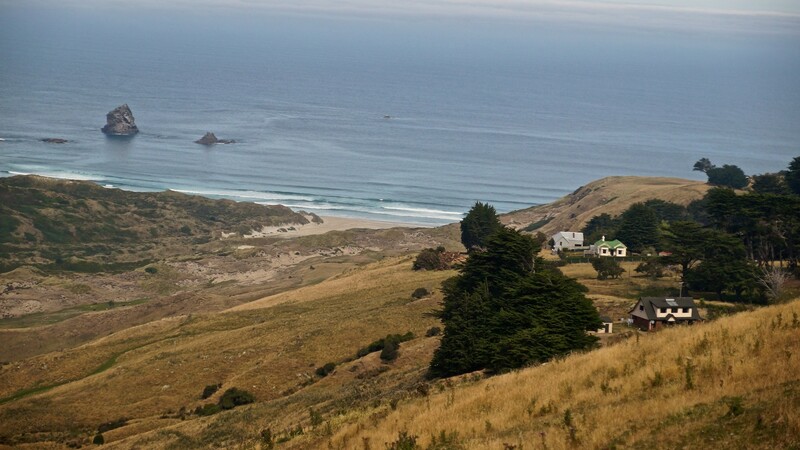 If you wanted to turn your Otago Peninsula tour into a two-day affair, there is accommodation in the village that would allow you to make a leisurely day trip even more mellow. 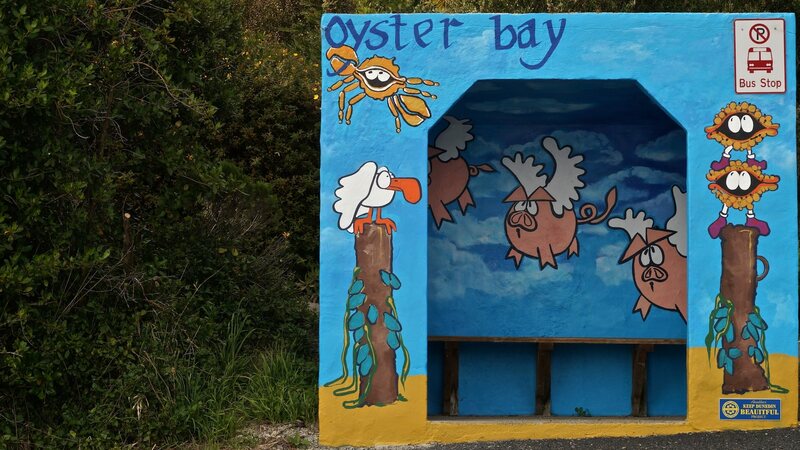 You’d have more time to get off the saddle and sample some of the beaches you cycle by! 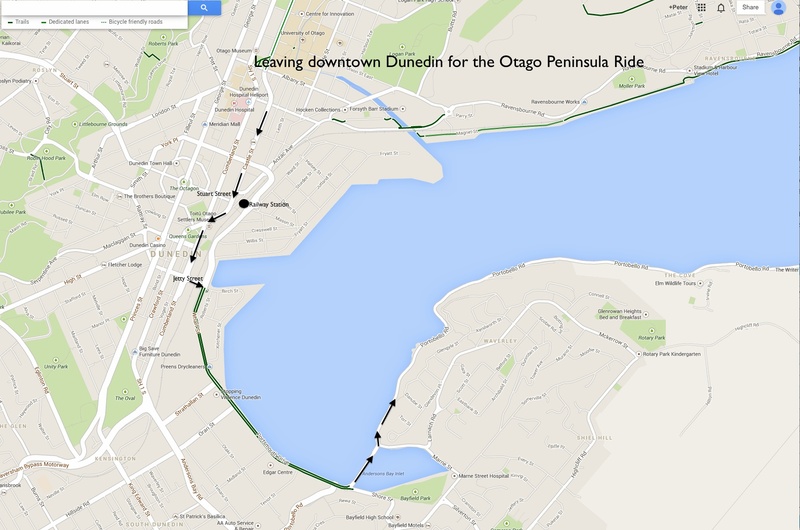 It took about two hours to cycle to the top of the Peninsula from downtown Dunedin. I didn’t stop at Portobello Village on the way, figuring I’d have lunch there a couple of hours later. 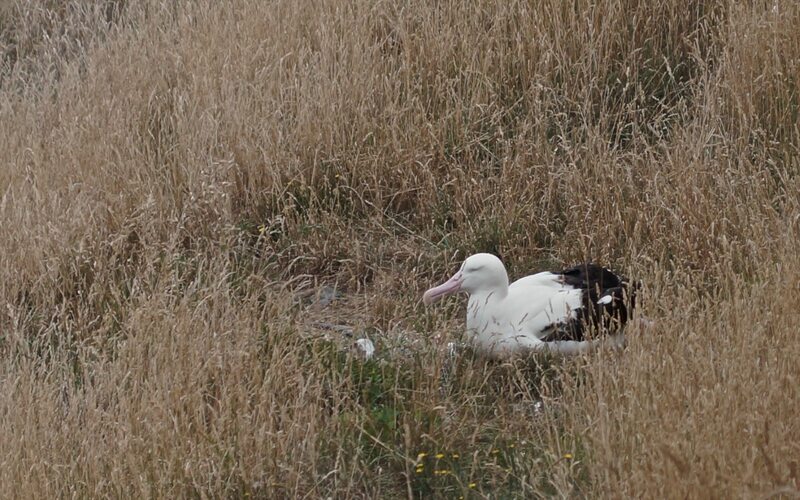 After dealing with the first hill of any note, I got to the end of the Peninsula and the Royal Albatross Colony. A cup of coffee and something sweet and I was left to consider whether to take the soon departing tour to see the albatrosses. The ticket wasn’t cheap at $35. ; I ended up rationalizing it as my contribution to the upkeep of the wildlife sanctuary. From the covered viewing station we could see a boat that was providing its clients with a different perspective of the one albatross that happened to be out on view that morning! Was it worth it? Sorta. I should mention that it really is a two-for-one deal since you get to tour the military installation that was once here – pre-WWI bunkers and an impressive 150mm mounted and retractable gun all ready to blast away any threat (supposedly the Russians!) to the British Empire. It was a pleasant one hour and a bit diversion from the main focus – the road and the water. Not far from the albatross colony was another attraction – the Penguin Place – but instead of spending another $40 for the entry fee there I decided to head back to Portobello for more caffeine and some lunch. On my way back to Portobello Village I did pass by this sign – clearly not all the locals are excited about the idea of turning the roads of the peninsula into a cyclist’s dream trip! 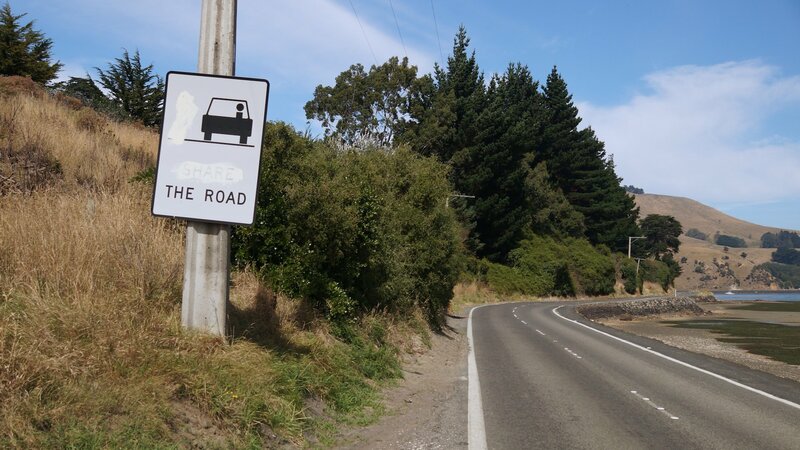 I did see this sign perhaps a half-dozen times in my travels on South Island; this was the only one that was defaced. (The cyclist to the left of the car has been painted over, as has the word “share” in “share the road”.) 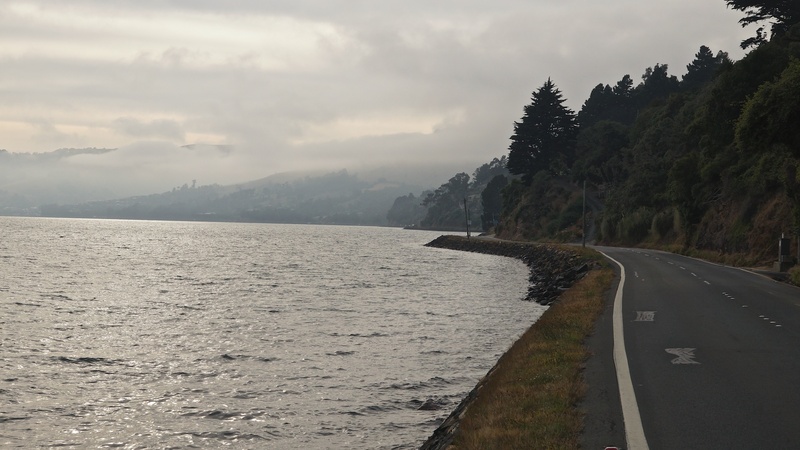 I should mention that I saw no other cyclists on the roads of the Peninsula and the traffic seemed quite light. Perhaps a weekend would bring out more vehicles and cyclists and create more tension on the roads. Share The Road – NOT! 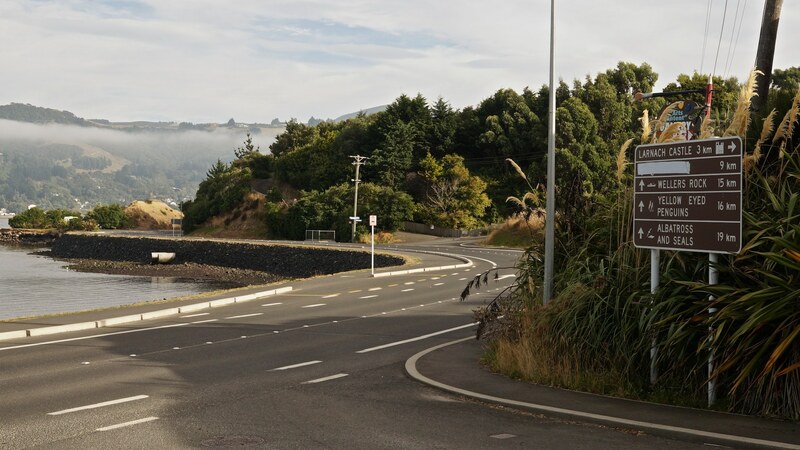 The weather, the fact that I was not riding with my usual fifty pounds of stuff, the variety of stunning views, the mostly traffic-free roads – these all made this one of my favourite days of cycling on South Island. It rivals the day I spent cycling from Wanaka to Queenstown via the Cardrona Road or the one I spent going over Arthur’s Pass to Greymouth. One reason I ended the day a bit early was because I had arranged to drop my rental bike off at a bike shop on Stuart Street before closing time. 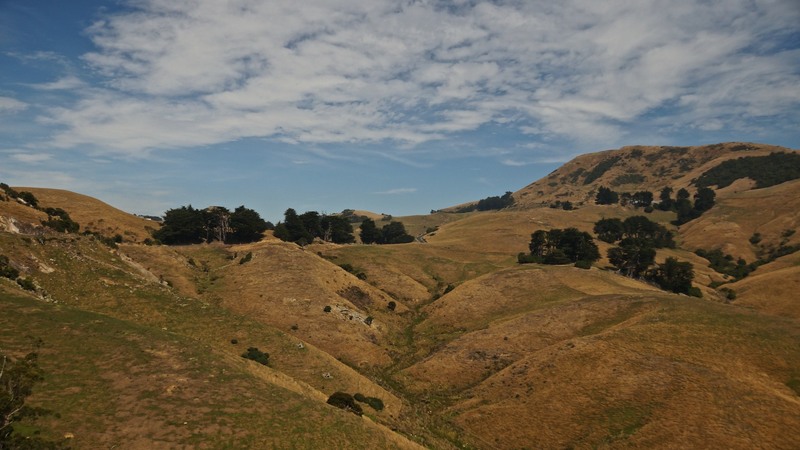 I had left with Christchurch almost three weeks ago; the next morning I would be bussing it back to Christchurch and the return flight to Toronto. After the bike drop-off, I stopped at a pub on the Octogon for a pint to celebrate a day’s worth of great bike riding. 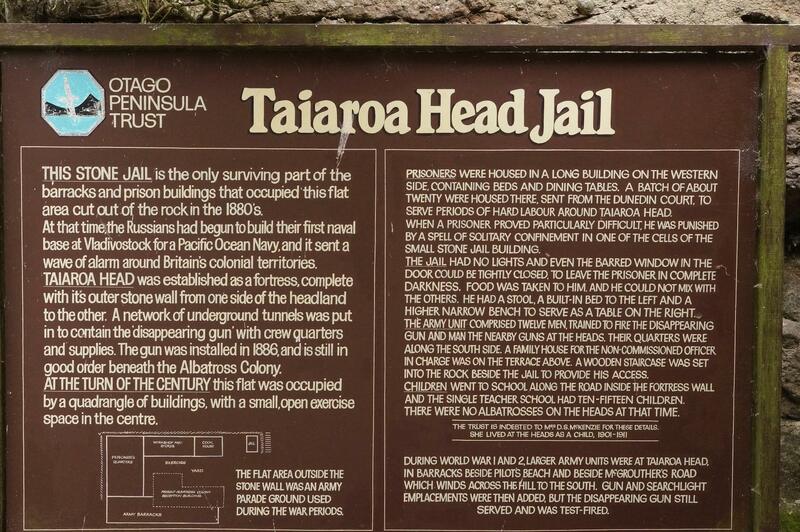 Wikipedia has informative entries on both the Otago Peninsula and on Taiaroa Head that will provide a good introduction to the area. 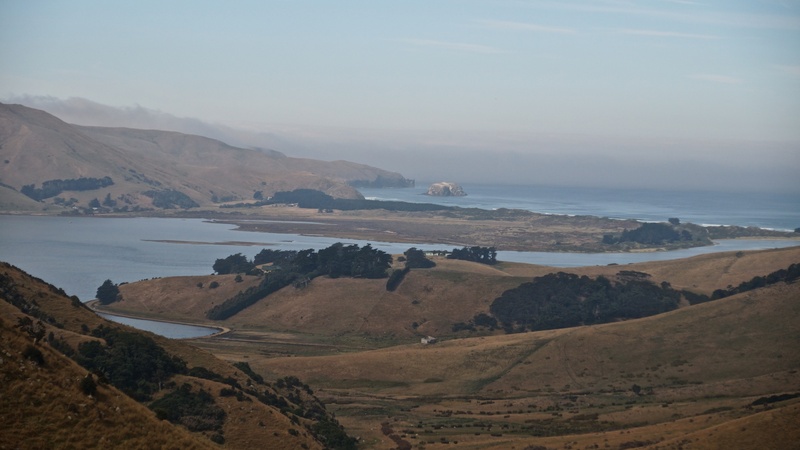 Fellow travellers have posted reviews of the Otago Peninsula at the trip advisor page here. You will gleam some useful tidbits of info and a tip or two as you skim through the comments. Do note that they are definitely writing from the point of view of motorists and not cyclists! 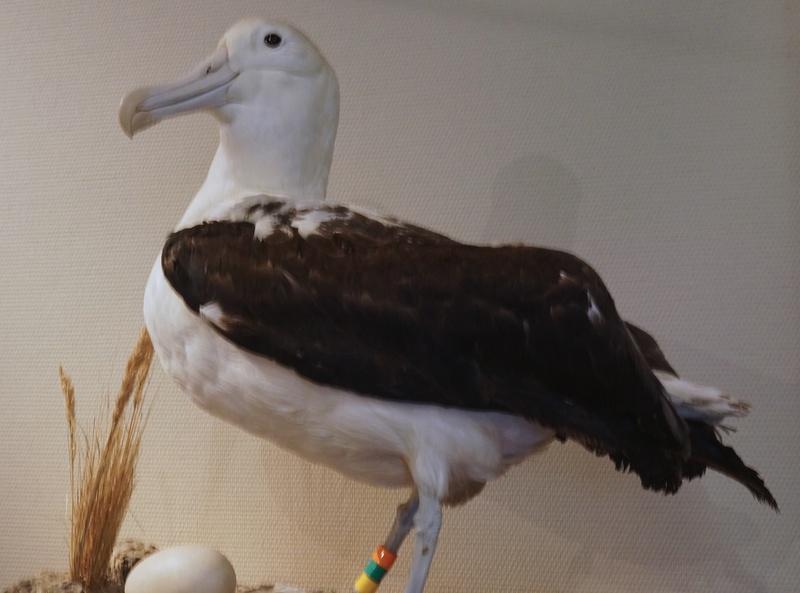 The Albatross Center website (here) provides info on tickets, tours, and more. 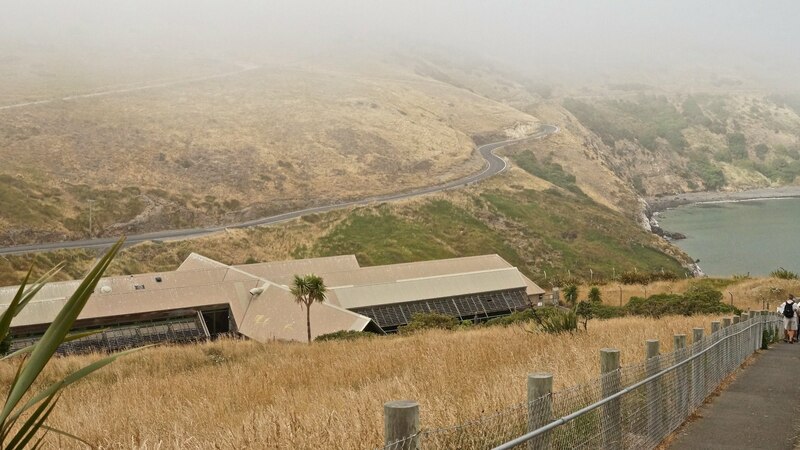 Just next door to the interpretative centre is a gated path that leads down to Pilots Beach; it is free and there is a chance you may see a penguin or two. Not far from the Albatross Center is the Penguin Place, a privately-run penguin sanctuary that has garnered very positive reviews. (See the tripadivsor website here.) The entry fee is $40. 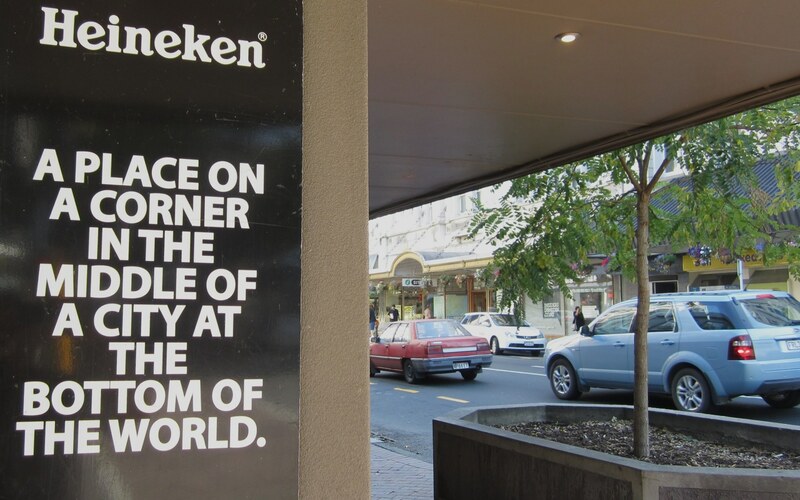 NZ. Noteworthy is the availability of rooms for $30. at their lodge. Had I known I may have planned my Otago exploration a bit differently, cycling out to Taiaroa Head for the day, staying at the Penguin Place Lodge and spending some time on the wild beaches nearby, and heading back to Dunedin the next day. The Penguin Place website can be accessed here. On the way back to Dunedin, just a few kilometres off the Highcliff Road is Larnach Castle. I did cycle right up to the entrance post. The $28. entry fee and an entry guard who wasn’t too keen on me leaving my bike with him for a couple of moments while I went inside to take a few photos meant I turned right around. 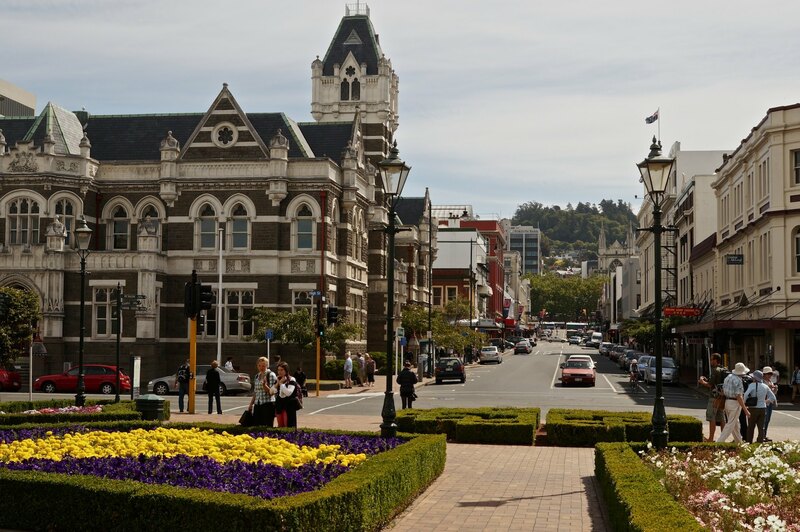 If you’re looking for accommodation away from the bustle of downtown Dunedin, the castle has a range of deals starting at $240.NZ for a package that includes a room, breakfast, and entry to the castle. Their website can be found here. 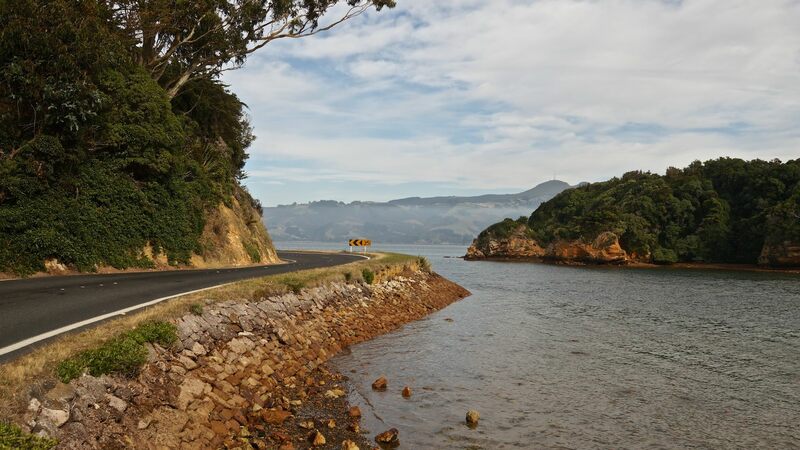 The Lonely Planet’s Cycling New Zealand (2009 vintage and due for an update!) 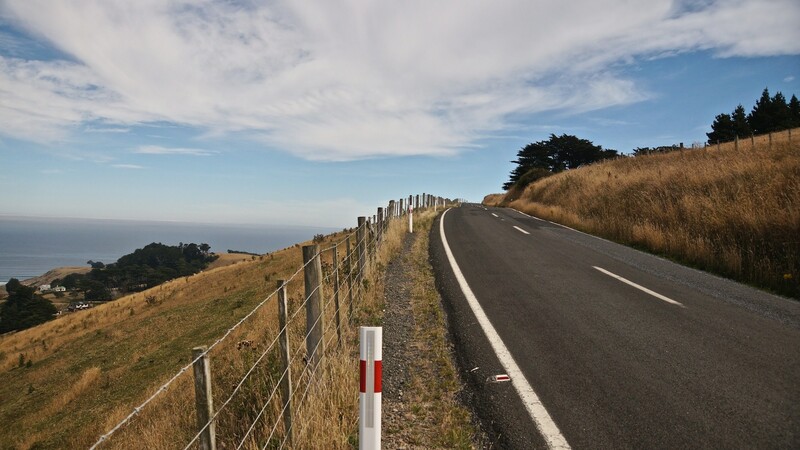 has a map and description of the Otago Peninsula ride (pdf download info here), which the writer summarizes in this way – “Those looking for a great ride with a real variety of terrain need look no further. 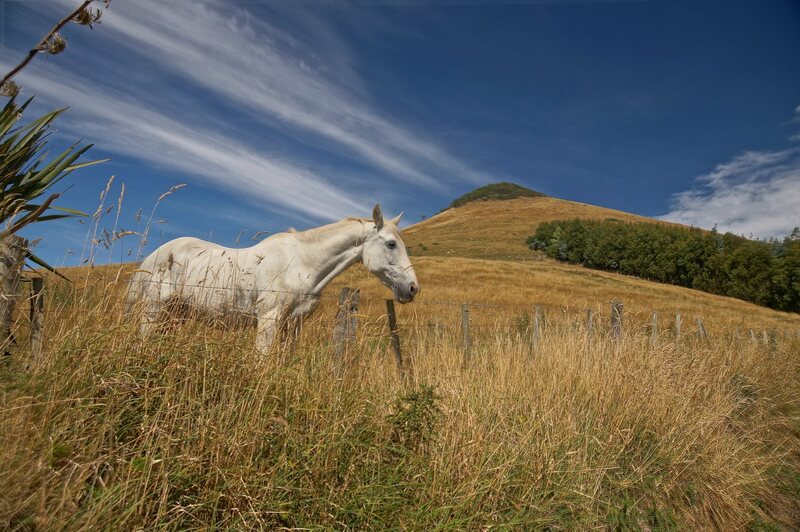 This day out on the road is a classic – easily one of the best day rides in the country.” I wouldn’t argue with his assessment. I also found the LP guide quite useful in spite of its age. The entire 64 kilometer route is nicely mapped on this bike map.net page. (Click here.) Using the graph on the bottom right hand side of the page you can preview every bump that you will face along the way. graphical profile of the 60+ km Otago Peninsula Route – See the bike map site for source – it’ will give specific altitude and map location for each point along the route. As you’ll see, it is only at Kilometer 43 that you will face the real challenge of the day – eight kilometres of mostly uphill cycling. The views will more than compensate for the time you spend spinning your lowest gears! 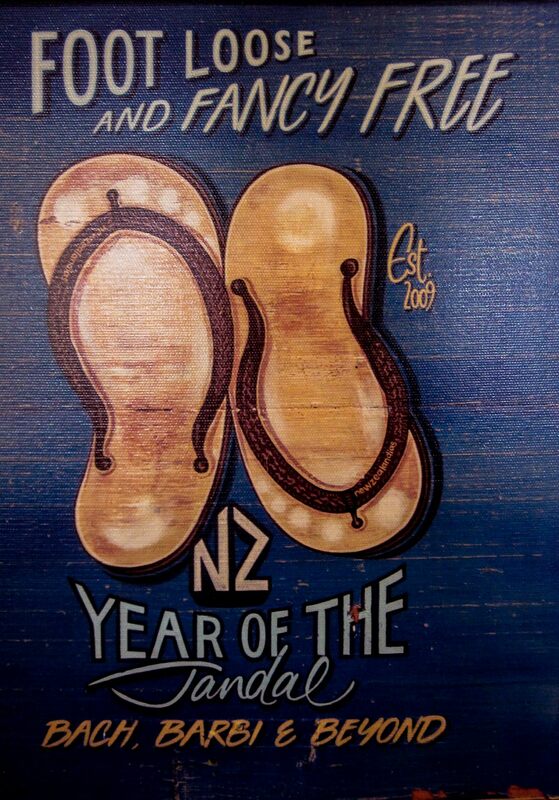 a Kiwi reminder to get off the bicycle every once in a while! 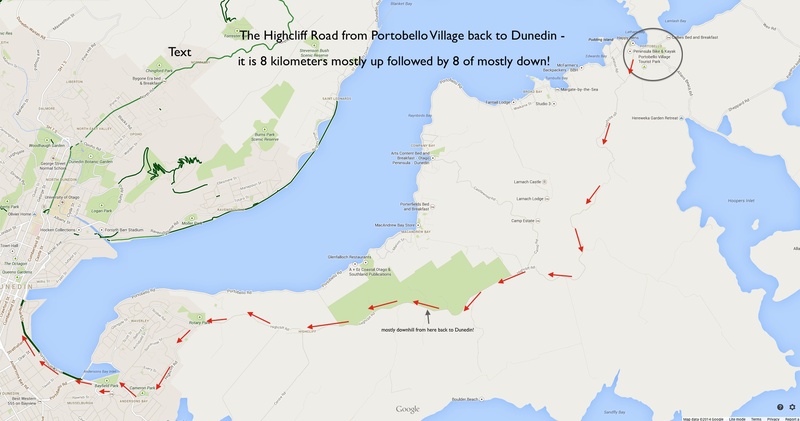 This entry was posted in bicycle touring and tagged bicycling from Dunedin to Taiaroa Head, bicycling Highcliff Road Otago, bicycling Portobello Road Otago, bicycling to the Albatross Colony from Dunedin, bicycling to the Penguin Place from downtown Dunedin, great New Zealand bike routes, Otago Peninsula Bicycle tour, Otago Peninsula road conditions for cyclists, top South Island bike routes, top-rated bike route in New Zealand. Bookmark the permalink.